DP World London Gateway is to start operating with the first ever fast charging electric shuttle carrier of Kalmar in the beginning of 2018. 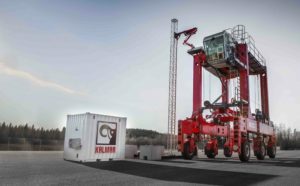 The fully electric powered Kalmar FastCharge(TM) Shuttle Carrier will be tested at DP World’s UK major container terminal for 6-12 months to ascertain the suitability of a fully electric solution for the port’s operation in the future. Launched in December 2015 and introduced at TOC Europe 2016, Kalmar FastCharge is the port industry’s first fast charging solution for electric powered shuttle and straddle carriers. It is based on the same opportunity charging technology that is used in electric buses with modern Lithium-ion (Li-ion) batteries. The charging station with a pantograph direct current charging system is located flexibly on the working route of the machines at a terminal. Charging happens during the idle time in the machine working cycle when it stops waiting for the next container job. Normal charging in operation takes 30 to 180 seconds, and with the maximum charging power of 600 kW, full charge can be achieved in a few minutes. What is also important is the environmental aspect of this solution. Kalmar FastCharge has zero NOX and CO2 emissions at the point of use as well as lower noise emissions which helps terminal operators minimize their carbon footprint and other environmental impacts. DP World London Gateway terminal is one of the most advanced deep-sea terminals in the world, investing heavily in the state-of-the-art technologies. The port is already utilizing a fleet of Kalmar hybrid-electric shuttle carriers which reduce fuel consumption by up to 40%.